Synopsis: Ritually murdered corpses are appearing across Cincinnati, terrifying amalgams of human and other. Pulled in to help investigate by the I.S. and FIB, former witch turned day-walking demon Rachel Morgan soon realizes a horrifying truth: a human hate group is trying to create its own demons to destroy all Inderlanders, and to do so, it needs her blood. She’s faced vampires, witches, werewolves, demons, and more, but humanity itself might be her toughest challenge yet. Review: Oh how I love this series! I could not wait to immerse myself in a new book by the author and it is with great pleasure that I’ve discovered this novel in the series. 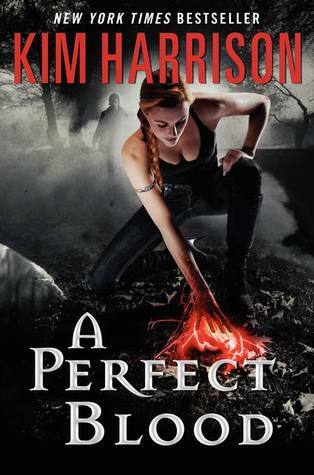 It is always difficult to find time to read my books but each novel Kim Harrison is a true delight! Besides, if you do not know the series yet, I highly recommend it to you. Rachel Morgan can finally live a quiet life as a demon and yet nothing is easy. Nobody recognizes her as a person and that begins with her driving license, something that irritates her at the highest point. But this innocuous demand will propel her into a story and a new race she did not expect. Indeed, it appears that a group of humans has decided to gang up against the Others to destroy them. Yet their murders are currently hidden from the population and a threat now hangs over the head of our witch. Indeed, if she does not find those responsible, the blame will fall on her, and Rachel will become the scapegoat of the IS and the FIB. Thus, accompanied by her friends Ivy and Jenks, but also a new bodyguard Waide, our heroine will launch herself headlong into the investigation. Alas, she could be related more closely with all this than what she believed. Moreover, by refusing to leave her bracelet, limiting her powers, the dangers which threaten her could be much more present than expected. But that does not change the fact that, as always, Rachel embarks on her battles head first without really thinking about the consequences of her actions. I have once again loved this novel! It’s pretty hard to see Rachel like that, reduced compared to her powers and ultimately according to what she is too. However, this does not change the fact that everyone is interested in her, to see what she will do and it is also why a very old vampire comes into play. I admit that I’m quite intrigued about him and I’m curious to see if we’ll see him later, just as in learning more about his intentions. Our heroine also relies on her friends in this volume, even if it is true that it is quite sad to see that they are changing their lives, far more than she is able to manage. And then we have Trent … Oh I was so happy to see him throughout the history, as he helps our demon, even if sometimes rather in clumsy way. It’s very interesting to see the connection between them, to see that they are here for each other even if Rachel does not know how to handle it all. I admit that I am very curious to read on to see how it evolves. New problems are also looming and it starts with this hate group that is determined to destroy all supernatural creatures. They have no limits on their actions and may well have placed members in large spheres of power. But it’s not just them because another group comes in and I admit that I was intrigued by their actions and I am curious to see what happens for them too. I do not forget about the Al’s appearances even if they are very infrequent compared to what we’re used to have. In any case it was a very good book and I am very eager to read more now, as always. I need to get back to this series Melliane! I was taken aback by the loss of a main character in book 3 or 4, I can’t remember which, and I just couldn’t continue on with the series after that. It’s been a good long time now though, so I think I might be ready to give Rachel and company another go! Yes I can understand that, it was a difficult moment for me as well. I know this series is over now but I only read the first two books and do plan on finishing it but it makes me so happy to know that all the books were fantastic, not just the first couple like some series. I hope you’ll be able to finish the series soon. They’re so good! I need to try her YA titles in fact myself. I want to do a relisten to this series. I miss it already. I think I’m really going to go into shock when I go a full year with no new releases. the only way I can possibly be motivated to read this series is if I have a buddy. There’s too many books, so easy to get demotivated… Similar to working out! It’s great that you’re enjoying it a lot though! This series seems to be getting better and better! 5 stars! Oh how I wish i’d gotten into these novels earlier. :/ Ten books seems like an insurmountable pile of catching up. Ooooh, I really need to catch up with this series!!! I stopped at book 2… but everyone loves it so will get back to it ASAP 😛 Great review! I loved this book too. Things are a changing!!! Loved Trent in it too. These two are so awesome together.